What makes us attracted to one metal over another? Certainly there are aesthetic reasons for choosing platinum for a wedding and engagement ring over yellow gold or rose gold. Platinum engagement rings have a clean and sharp quality that juxtaposes gems. Platinum wedding rings also have a purity that compared to alloyed gold is otherworldly. When people consider platinum, what comes to mind is snow white, pure, enduring and elegant. These are qualities that almost have religious or otherworldly overtones as if spirit itself was made manifest in metal. The symbolism of platinum is derived from platinum’s physical qualities. The first use of platinum was recorded 2500 years ago in ancient Egypt in an old coffin of an Egyptian high priest. Hieroglyphs decorated with platinum were found perfectly preserved, which is evidence of platinum’s enduring strength through the ages. The early Incas made platinum jewelry, though much of it was lost due to Spanish Conquistadors mistaking it for silver. In European culture, platinum became popular in the 1700s, mainly among royalty. The symbolism of platinum was tied to rarity and exclusiveness. Even from the beginning, the platinum wedding ring club made a statement! The early symbolism of platinum carries over into how the metal is viewed today. A platinum wedding ring symbolizes exclusivity. We have platinum credit cards and platinum clubs and platinum statuses on airlines. If you are in a rock and roll band and your album goes platinum, you’re probably having a pretty good day. The symbolism of platinum retains its earlier significance. It is enduring, lasting and extremely durable and has high status. The emotional quality of status is intimate to the attraction of platinum in a platinum wedding or engagement ring. Yet, platinum has other qualities that are not necessarily reflected in the marketing symbolism of platinum. To work with platinum is much more difficult than gold and silver. It is difficult to shape and form. 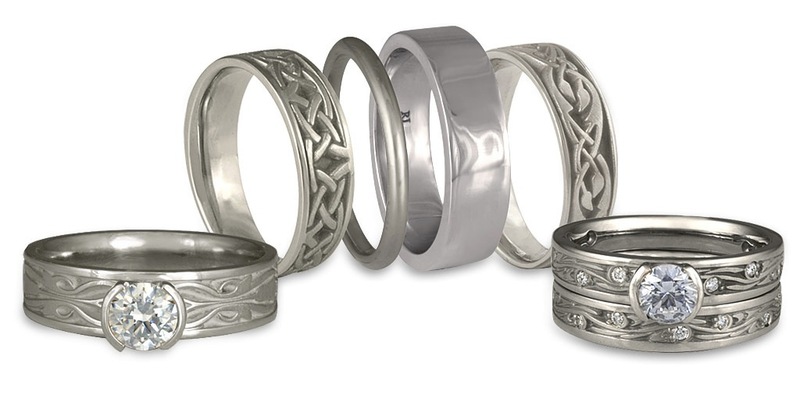 Therefore, platinum jewelry and platinum wedding rings are most often created through casting techniques, rather than through hand fabrications. Typically, the process involves creating computer-generated illustrations that are machine cut into wax and then cast mechanically. Even the process of casting is very difficult compared to silver or gold. What may attract us to choosing a platinum wedding or engagement ring? Our feelings and attractions can result from a combination of many different influences. Platinum symbolizes durability, purity and a high status in our society, making it a strong choice as a statement for a wedding or engagement ring.